Despite being referred to as winter sports, you can now enjoy activities like skiing and snowboarding all year round. Although they are a fun way of keeping fit, it’s important that you are well equipped and properly trained before trying out any activities, because –with any sport – there is always the risk of injuring yourself. Having the proper equipment is paramount to enjoying winter sports in a safe and fun way, and this goes beyond just purchasing the right snowboard or skis. You need to properly equip yourself for the sport you are looking to get involved with and for the environment you will be in. Although wearing a helmet isn’t a legal requirement, winter sports are high-speed activities and they involve terrain that can easily become dangerous, so you should view a helmet as an essential piece of equipment. You also need to bear in mind that most insurance policies require you to wear a helmet, regardless of the local laws, and not doing so can void your policy. Sun protection probably isn’t the first thing that comes to mind when you think about winter sports, but it plays an important part, because the sun is much stronger at higher altitudes – so you’ll need a good sun-cream and glasses or goggles with 100% UV protection. Whether you’re heading out on a snowboard or a pair of skis, you’ll need to ensure that your boots are the right fit. Unlike other equipment that you can buy second-hand, you should always get your boots professionally fitted to make sure that they will be comfortable and provide the necessary support. You should always take part in winter sports in specifically designated areas that are supervised by professionals, with trained first-aiders on-site. However, it doesn’t hurt to come prepared with a personal first-aid kit too, especially if you have a pre-existing condition or certain medication that you would need in case of a medical emergency – such as an inhaler. Your first-aid kit only needs to cover the essentials, so that it’s still compact enough to pack with the rest of your equipment. The sporting professionals you see on TV make it look easy, but winter activities require training and practice to master. You need to be realistic about your own ability and consider booking some lessons with an instructor if this is your first time, or if you’re out of practice. Training should also extend beyond your sporting skills. 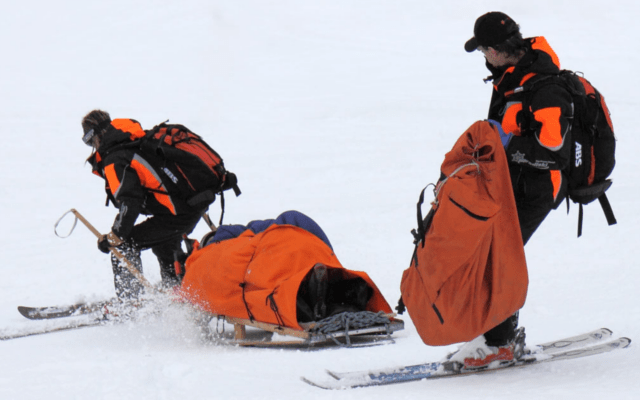 If you’re planning on regularly getting involved with winter sports and have never taken a first-aid training course, you should consider enrolling on to one. Training will prepare you to deal with medical emergencies and will also equip you with the skills you need to make the most of your first-aid kit. Taking a first-aid training course might sound overly cautious, but basic knowledge – like knowing how to stabilise injuries, or how to administer life support until emergency medical services arrive – will come in handy should you or someone you’re with have an accident. You should also check to see if the first-aid course you’re looking to take offers training on the use of AEDs, as this is a life-saving skill if you’re planning on going off-piste. With the right training and equipment, you can enjoy winter sports whilst staying safe and avoiding any unnecessary risks. Remember to always check your equipment before heading out for the day and keep an eye on the weather because conditions can rapidly change at high altitude, significantly affecting visibility. This article was written by defibshop, the UK’s only independent defibrillator retailer. defibshop has recently produced an infographic on safety in extreme sports.